Micron has a plan to reward shareholders. The objective of investing is, of course, for your stocks to go up over time (a shocking revelation, I know!). However, because Foolish, long-term investors advocate holding stocks for years, there might actually be times when you wish a stock you own would go down for an extended period, even if you already have a full position. I believe that's currently the case with Micron Technology (NASDAQ:MU), which has been one of my best-performing stocks this year. Read on to see why a drop in price could lead to good things for Micron investors. Micron's stock has been all the rage recently, nearly doubling in price over the past 12 months. As one of only three producers of dynamic random access memory (DRAM) and one of only six producers of NAND flash memory, Micron has benefited greatly from soaring memory prices. While the industry has traditionally been tied to the mobile and PC markets, demand for memory has expanded (even exploded) to cloud data centers, artificial intelligence workloads, and specialty embedded chips in connected devices and self-driving cars. Micron is not without skeptics, though, especially those who believe we're at a peak in memory pricing. That's why Micron trades at a shockingly low forward price-to-earnings ratio of 5.5. Memory has been cyclical -- sometimes violently so -- and investors seem to be nervous about granting Micron an earnings multiple in line with the overall market, which currently trades at a forward P/E of 17.3, more than triple that of Micron. That's fine by me, though. In fact, I hope Micron's valuation remains under pressure for the foreseeable future. Why do I want Micron's stock to go down? Image source: Getty Images. 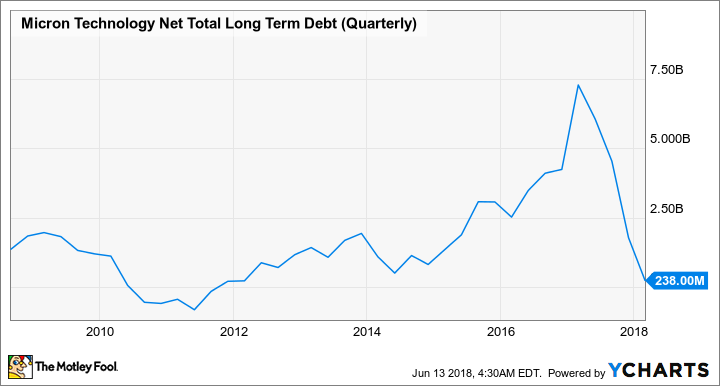 After years of carrying billions in debt, Micron's recent success should allow the company to become "net debt neutral" -- having as much cash as debt -- by the end of this quarter. That would be the first time in many years that's happened. MU Net Total Long Term Debt (Quarterly) data by YCharts. Now that its balance sheet has been repaired, Micron will begin returning cash to shareholders in the form of a massive $10 billion share repurchase program that was announced at the company's May analyst and investor event. There's one small catch, though: These stock buybacks won't kick in until the beginning of Micron's next fiscal year, which begins in September. Until then, Micron will pay down its secured debt, some of which is denominated in foreign currencies, requiring expensive currency hedges. After that point, the company's plan is to return at least 50% of its free cash flow to shareholders. Since we now know that Micron plans to begin buying back stock come September, I'm hoping for shares to languish. The lower the price, the more shares Micron can buy, and the larger the "gains" for us remaining owners. At the current $70 billion market capitalization, $10 billion could buy back almost 15% of the company. And I may not have to wait that long for results -- the company could feasibly generate $10 billion in cash flow just in the upcoming year, should memory pricing remain stable. Of course, if my take on the memory industry is wrong, Micron's intrinsic value would not be as high as I might think, and the upcoming repurchases would be wasted on buying overpriced stock. But despite recent gains, I still think Micron is undervalued, and that favorable changes to the memory industry will last longer than others think. Past cycles have caused the industry to consolidate to only a handful of players, and with demand for memory and storage exploding, I think profitability can hold up throughout the cycle better than in the past. We'll find out more about the company's financial performance when Micron reports earnings on June 20. If profits continue to grow, retiring shares at today's prices should greatly benefit all shareholders. And if the company can retire shares at even lower prices come September, all the better for us long-term believers.